The difference between a time-honored style and a passing trend or fad is often hard to determine. In 2002, no one thought we’d ever be speaking out about the horrors of the Web 2.0 style – and yet here we are. If your site is still ridden with reflections, glossy buttons and floating marques, you are completely outdated. Anyone who followed something trendy has experienced that feeling when their site looked horrible just 2 years later. So how do we ensure we are not just following a trend, or creating something that follows the time-honored principles of great design? The first thing we can do is to break down the Flat Design style and see if its foundations are based on tried-and-true graphic principles. So before you start redesigning your site after the latest Flat Design mockup, let’s take some time to research this style and see whether or not it has some validity. Animation is something that many “Flat” websites are placing more attention on. This is exciting, because for several years, we’ve all but ignored this feature for our websites. Either that, or its been so overdone that it totally took away from the message and purpose of the site – yes, I’m looking at you Adobe Flash! Simple animations can go a long way to making your website or application more user-friendly and engaging for your customers/users. I’m thinking of the kind of animations we see on Windows 8 or different apps like Mailbox, Clear, Letterpress, or National Parks. You can view a demo of the animations here. Also be sure to check out Sara’s CSS3 demo of some creative Windows 8 animations. So “Flat Design” could be a trend or it could be a revolution based on time-honored design principles – it all depends on how you as a designer implement your designs – and how well you understand design principles. The problem we are seeing is that many designers are simply copying leaders in the field who actually understand the principles behind this style. This ultimately leads to overused colors, fonts, and other different elements and styles. In reality, Flat Design is simply an implementation of “Minimalism”. Your action step for this week is to read a book on some of the foundational principles of design, and then to create something “Flat” that is based on solid design principles – not just a current trend. Make sure it’s super usable and that it looks amazing! If you need a book recommendation, I’d recommend Mark Boulton’s “Designing for the Web” – it’s a must read for every designer and developer. So what do you think? 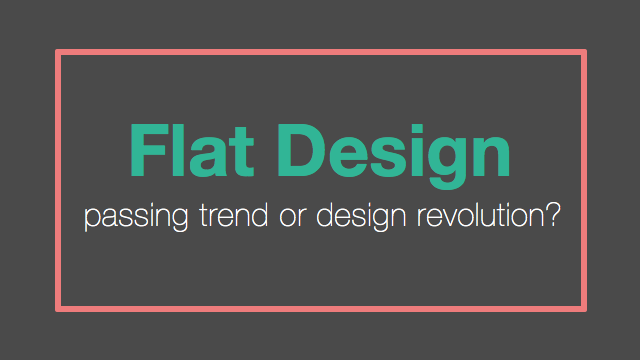 Is “Flat Design” a trend or is it more? I’d love to hear your thoughts, as well as any links to “Flat” things you’ve created. Also, be sure to read our followup to this article – Flat Design some good, some bad. Interesting article here. With rumours of Apple’s Jonny Ive bringing flat design to iOS7 it would appear that this design concept will continue to grow for now. I suppose the negative side you pointed out (where people don’t know where to click) could be addressed by subtle stylisation, but I agree that animation enriches the user experience and can help to navigate websites. I also think Flat Design lends itself well to RWD as more minimalistic approach is sure to make designing for different devices a more manageable task. Users certainly wont want to have too much ‘skeomorphic’ clutter on their small smart phone screens; the cleaner approach seems like the way forward. Typography has played it’s part in design for centuries so it’s probably good for Flat Design that more web fonts are coming to the fore and will prolong it’s popularity. I hope Flat Design isn’t a fad, but design trends change and fashions go full circle so we could be championing gradients and textures again in 10 years time! Yes, Chris it will be interesting to see what Apple does with IOS 7. Will they simply copy Microsoft and Google – or will they come up with something a lot more refined and user-friendly. If history proves itself, they will probably greatly improve on the “Flat Styling” that many other companies have created. Apple may not be the first at creating something, but when they do release it – it’s usually much better than the competition. btw, have you created anything with a “Flat Style” lately? I’ve seen some flat designs that I really liked but I prefer the application for sites that are trying to be goofy and playful. To me flat looks too cartoony for most sites. People will miss the visual cues that help us navigate. Microsoft Metro design has been a failure and already windows 8 has started to give users the option to bypass it. Apple is rumored to removing skeuomorphism. That doesn’t necessarily mean flat. Removing leather and fake paper rips can be achieved without making things look like cartoons. Apple’s design will still be elegant and beautiful. I agree Jim some of the Flat websites I’ve seen have been a little “cartoon-ey”, but some have been very well done. There has to be a good balance between simplifying things, and still having good design and visual cues for our users. Check out http://fltdsgn.com/ for some good examples “Flat” style websites. http://mapbox.com/ is nice as well, but that top graphic has a little bit of the “cartoon” feel you were talking about. Just remember that everything you design is communicating something – I can’t say this enough. Every color, gradient, word and font choose will affect what message your website is promoting. The “cartoon” feel may be perfect for some things, while a more polished “high-end” feel may be better for another project. With all due respect, maybe practice what you preach… The logo on this site is awful, the graphics look tacky and the bold font used in the articles doesn’t work. Even the ‘flat design’ graphic at the top of the post is an example of bad design. It doesn’t reflect the current styles of flat design you discuss, the alignment is off, the colours clash and it just looks wrong. Don’t mean to be rude, but it just seems strange to write an article on design standards when this whole site needs an overhaul and commits hundreds of design crimes. @Dan, I appreciate you sharing even though you throw some pretty tough criticism. The “Flat Design” header graphic at the top of this post was created to show how little thought some designers are giving to this design style. The peachy red and web green are some of the most over-used colors on the web right now. Sorry Caleb but I was really thinking the same thing as Dan. I found this article on Google and was immediately put off but the logo at the top of the page and the entire site design really. I mean no offense by it, and after reading the article I was really sort of surprised that someone who created this site could have such a good theoretical grip on fundamentals of design. Why don’t you redo this website? Rob, thanks for your thoughts. You are right I really do need to make some updates and fixes to my site design. That is something I am tackling this year as I have spare time from my other projects. Good information for newbies in web design. I recommend to articles about flat design – http://designmodo.com/flat-design/ and about colors in flat design – http://designmodo.com/flat-design-colors/ to be more clear what is that and how to use it. Yes i love flat design, but is very important to make usable website in very clear website. Hmm, it’s a version of what good designers have been doing for years except it’s now available in chalky colours. Great article! I’ve been chosen to think about new, flat design of course, graphics for my company’s applications. Reading your text is really helpful, I won’t make it thoughtlessly thanks! Thanks for sharing @Tooliepanna – just follow established design principles that you know, and I am sure they will turn out great! @Ed Thanks for sharing your thoughts. You mentioned you feel like you are wasting the power of Photoshop by not creating a “heavy” graphic with lots of gradients and drop-shadows. There are many people that are starting to use Photoshop as more of an asset creation tool, rather than a “static site mockup” tool. @Diana Yes, using trending colors will make your site look more “modern”. The thing I would say is that you should always be aware of what the colors you are using are communicating. For instance, red is associated with energy, war, danger, strength, power, determination as well as passion, desire, and love. So rather than simply using a color because you’ve seen it on other designs, choose a color that matches the feelings you want to portray with your design. Great article. I’ve not read all of the comments so excuse me. Trend or revolution? – well it’s still here and growing 18 months after the first post so it could be moving beyond a trend. I think it’s an inevitable evolution. Web design is still young compared to other media and the rate of technology change (notably mobile) has placed new demands. Let’s hope it’s here to stay. As a user it is so much nicer and easier. And as a marketeer with designer aspirations I can achieve some great results within simple means. As a budding graphic designer, I have really fallen in love with flat design. Yes, it may be ultra-simplistic, but that’s what makes it so awesome! Personally I can’t stand all of the ugly shadows and gradients that came and went in the past decade. But hey, to each their own. I like the tip about typography because it’s something I didn’t used to think mattered, but having seen what an improvement it can make I now think otherwise! The flat, bland trend has taken over the web like cancer, almost every site looks the same. Yes a lot of sites in the past did overuse the flashy effects but there is a happy medium somewhere. Clickable controls should be clearly identifiable as such. Subtle shadows and raised buttons do a great job of communicating this. Personally I think flat is an excuse to be lazy, or trying to hard to look “modern” that it tosses out usability in the name of style. Something to consider, Windows 8 has its fans but was a dismal failure in the market. Windows 10 continues the flat design and after more than half a year on the market with a heavily pushed free upgrade it has only recently passed the ancient Windows XP. The elegant Windows 7 with its slick glossy Aero theme still holds the lion’s share of the OS market at more than 50% of all PCs. In the long-lasting battle between Flat and Material design, there is some kind of a compromise found — Semi Flat Design. (by https://www.cleveroad.com/blog/how-to-improve-user-engagement-and-acquisition-in-2017) What does it mean? Flat design is becoming more dimensional with some lights and shadows that are incidental to the Material design concept. The feature of depth is added to the Flat design trend, that’s it.